Figure 1: Contour method measurement in a valve seat. The contour method is a mechanical measurement technique for mapping residual stresses in engineering structures. First introduced in 2000 [1, 2], it relies on the surface deformation that results from stress relaxation over a newly cut plane to calculate the residual stresses that existed in the component before the cut. The main advantage of the contour method is its ability to produce a 2-D map of residual stress acting normal to the cut surface. Other mechanical techniques, such as hole drilling, deep hole drilling, layer removal and slitting, produce single residual stress line profiles. The typical uncertainty for the Contour Method is around 30 MPa for steel and 10 MPa for aluminium . The Contour Method theory is based on Bueckner’s elastic superposition principle . The infographic in Figure 2 shows the initial residual stress distribution acting in the horizontal direction in a given structure (step A). The plate is cut into two parts along the plane of interest (step B). This causes the cut faces to deform elastically due to the relaxation of residual stress. The resulting deformations (the contours) are measured using a surface profiling device with sufficient resolution (step C). After processing the data (step D), the virtual stresses required to ‘force back’ the deformed surfaces to their original shape are calculated (Step E). The results given in step F represent the initial stress distribution from step A acting normal to the plane of interest. An example of the surface plots for both halves and the 2-D residual stress map calculated using the FE analysis is given in Figure 3. The Contour method has been applied to a wide range of larger engineering components and to various weldments [2, 5–9]. Recently, it has been extended to measure more than one component of the stress tensor by using multiple cuts [10–12] and by combining it with other residual stress measurement techniques [13, 14]. It has also been adapted to measure residual stresses using the surface topography of plane-strain fractures [15, 16] for forensic studies. Unlike diffraction, magnetic and acoustic techniques, the contour method is virtually insensitive to changes in microstructure resulting from effects such as welding thermal cycles. These attributes are particularly useful for residual stress analysis in structures for many industries such as nuclear & power, aerospace, petrochemical and transport. Figure 2: Contour method infographic. As with other mechanical methods, it is assumed that the material behaves elastically during cutting and that the cutting method does not itself introduce stresses to the cut surface. In practice, the nature of the cut is the most significant contributor of uncertainty in contour method and a machining technique is required to give a nominally flat surface for a planar cut profile while maintaining a thin and uniform width of removed material. Wire electric discharge machining (EDM) is the preferred technique that best matches these requirements though this limits the technique to being able to measure residual stresses in electrically conductive structures only. In addition to the difficulties associated with the machining itself, localised plasticity can occur during the cut, invalidating the elasticity assumption. This is particularly relevant when the material has high residual stresses relative to the yield stress. At The Open University, our colleagues developed optimised cutting and clamping strategies that greatly reduce the risk and overall effect of localised plasticity [17, 18]. StressMap routinely applies these cutting-edge techniques to deliver the highest quality in residual stresses measurements with the contour method. 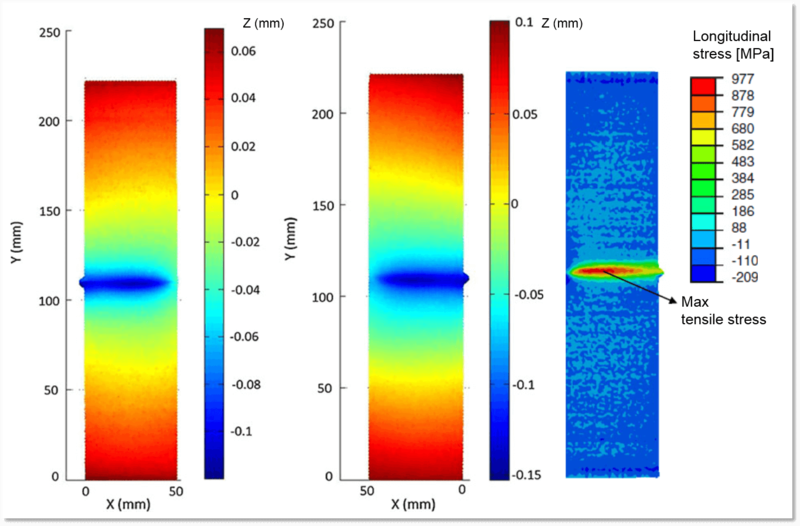 Figure 3: Residual stress in an electron beam welded Ti-6V-4Al alloy. With permission from our partners, we showcase selected measurements using the contour method in our projects page. These range from residual stress measurements in additive manufactured aerospace structures to medical prosthetic knee replacement implants. Prime, MB, Gonzales AR, 2000, The Contour Method: Simple 2-D Mapping of Residual stresses, The 6th International Conference on Residual Stresses, IOM Communications, London, UK, Oxford, UK 617-624. 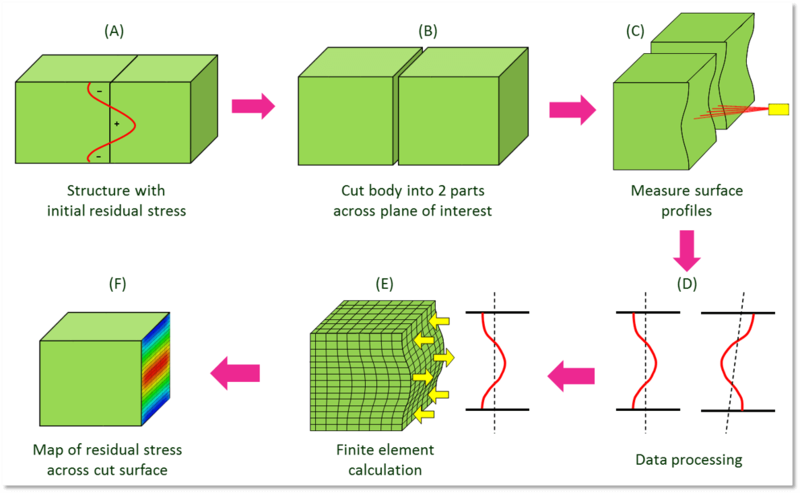 Prime, MB, 2001, Cross-sectional Mapping of Residual Stresses by Measuring the Surface Contour After a Cut, Journal of Engineering Materials and Technology 123(2):162–168. Practical Residual Stress Measurement Methods. Wiley 2013, 109-138, ISBN 9781118342374. Bueckner, H., 1958, The Propagation of Cracks and the Energy of Elastic Deformation, Transactions of the American Society of Mechanical Engineers 80:1225–1230. Prime MB, 2011, Contour Method Advanced Applications: Hoop Stresses in Cylinders and Discontinuities, Proc. of the Soc. for Exp. Mechanics Series, Vol. 836, 13–28. Prime MB, Hill MR, DeWald AT, Sebring RJ, Dave VR, Cola MJ, 2002, Residual stress mapping in welds using the Contour Method In: Proceedings of the 6th international Conference: Trends in welding research April 15-19, 891-896. Zhang Y, Ganguly S, Edwards L Fitzpatrick ME, 2004, Cross-sectional mapping of residual stresses in a VPPA Weld using the Contour method, Acta Material, 52: 5225-5232. Hosseinzadeh F, Toparli MB, Bouchard PJ, 2012, Slitting and contour method residual stress measurements in an edge welded beam, J Pressure Vessel Technol, 134 (1). DeWald AT, Hill MR, 2006, Multi-axial contour method for mapping residual stresses in continuously processed bodies’, Exp. Mech, Vol 46(4) 473-490. Pagliaro P, Prime MB, Swenson H, and Zuccarello B, 2010, Measuring Multiple Residual-Stress Components using the Contour Method and Multiple Cuts, Exp. Mech, Vol. 50(2), 187–194. Kartal ME, Liljedahl CDM, Gungor S, Edwards L, Fitzpatrick ME, 2008, Determination of the profile of the complete residual stress tensor in a VPPA weld using the multi-axial contour method, Acta Material, 56:4417-4428. Pagliaro P, Prime MB, Robinson JS, Clausen B, Swenson H, Steinzig M, and Zuccarello B, 2010, Measuring Inaccessible Residual Stresses Using Multiple Methods and Superposition, Exp. Mech., Vol. 51(7), 1123–1134. Hosseinzadeh F, Bouchard PJ, 2012, Mapping multiple components of residual stress tensor in a large P91 steel pipe girth weld using a single contour cut, Exp. Mech., Vol. 53(2), 171–181. Prime, M. B., DeWald, A. T., Hill, M. R., Clausen, B., & Tran, M., 2014, Forensic determination of residual stresses and KI from fracture surface mismatch Engineering Fracture Mechanics, 116(0), 158–171. Araujo De Oliveira, J., Kowal, J., Gungor, S., & Fitzpatrick, M. E., 2015, Determination of normal and shear residual stresses from fracture surface mismatch, Journal of Materials & Design, 83, 176–184. Hosseinzadeh F, Traore Y., Bouchard PJ, Muransky O, 2016, ‘Mitigating cutting-induced plasticity in the contour method, part 1: Experimental, Int Jour of solids and structures, Vol 94-95, 247-253. Hosseinzadeh F, Ledgard PA, and Bouchard PJ, 2013, Controlling the Cut in Contour Residual Stress Measurements of Electron Beam Welded Ti-6Al-4V Alloy Plates, Exp. Mech., vol. 53(5), 829–839.